This 3 mm full stretch wetsuit combining comfort, ease of removal, and a stylish design is great for all kinds of marine sports such as diving, snorkeling, skin diving, surfing, and wakeboarding. 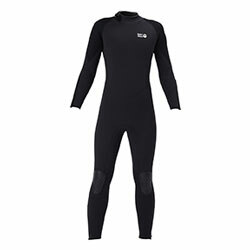 Offering superior athletic performance and ease of removal, enjoy marine sports more comfortably with this wetsuit. The full-stretch material makes it easy to find the right size right off the rack. As in the neck seal, the wetsuit features smooth skin piping on the wrists to improve waterproofing and sealability. The superstretch fabric combined with the ankle zipper, which was developed by us makes this wetsuit especially easy to get on and off. Even beginners will find using this wetsuit a breeze.